Being widely acknowledged as the creator of the entire SUV segment with the Suburban in 1935, Chevrolet has more than 75 years of experience in designing great sport utility vehicles. At the 2013 Geneva Motor Show, the brand presented the restyled edition of its Captiva compact SUV in Europe for the first time, and now it is available to order. The new Captiva introduces several changes to the rear and front of the vehicle, including new LED tail lamps, angular chrome exhaust tips and a remodelled bumper. Up front, it sports a lower bumper, a new grille mesh as well as restyled fog lamps. New 18-inch alloy wheels further enhance Captiva's road presence. 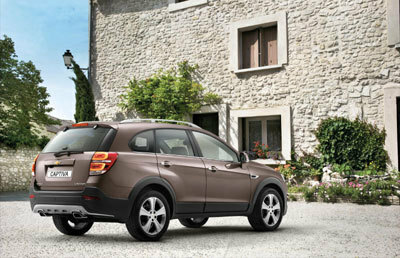 The Captiva now features keyless entry and start as standard on upper trims. Inside, the vehicle will boast fresh seat colors, new fabrics (upper specifications: leather seats), and restyled trims in the instrument panel. A dual-zone climate system, an ambient lighting package and heated rear seats provide even more comfort on select specifications. Offering up to seven seats, along with additional convenience features, the restyled Captiva is a typical SUV for the family. "Captiva is the ideal companion for those who want to have some adventure, but feel that they could do with more space, capability and that extra bit of convenience," says Susan Docherty, President and Managing Director of Chevrolet and Cadillac Europe. The new Captiva is available in 3 trims, with LS starting at £21,295, LT starting at £26,995 and top level spec LTZ starting at £29,995. It is available in 2.2VCDi both automatic and manual. For more information, visit chevrolet.co.uk.